Even with my "getting worst every day" garbled screen problem, I could make Seaside 2.7a-169mb version work mostly stable on the computer. I'll try to finish it as soon as it's possible. The sushi store, halos, and some other stuff is working. 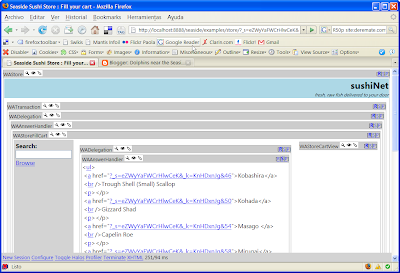 Below is a screenshot of Sushi Store running on seaside 2.7, over Dolphin Smalltalk X6. And BTW, it runs fast!